Weddings in India are a grand spectacle and like anywhere else in the world; the stars of this show are the bride and the groom. However, brides and grooms in the country differ from one region to the next. This is because India is a land of many ethnicities, languages and cultures and where there are many ethnicities, languages and cultures; there is bound to be many different kinds of people with different customs and practices. Love may be the common bond that binds soon to be wedded couples all over the country but wedding rituals, customs and even wedding garments vary according to different ethnicities and cultures. The variation of wedding garments for both the bride and the groom in different parts of the country is a subject worth exploring and this blog aims to do just that. 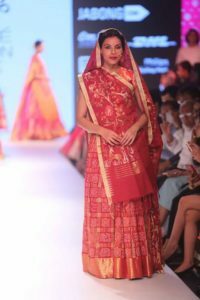 Read further to know about varying traditional garments for brides from different cultures within India. Both Hindu Punjabi and Sikh Punjabi brides tend to stick with the lehenga choli or Salwar kameez ensemble for bridal wear. The traditional color is red or variations of this shade however pink and shades of pink have seemed to gain popularity in recent times. The dupatta is the essential head scarf; not subject to whether the Punjabi bride is wearing a Salwar kameez or lehenga choli ensemble. The bride is mostly bedecked in ethnic design gold jewelry including but not limited to bangles, Sitahar, Mang Tika and Jhumar (Chandelier) earrings. Most Bengali brides opt for an authentic Benarasi saree on their wedding day. These sarees are red, maroon or pink in color. 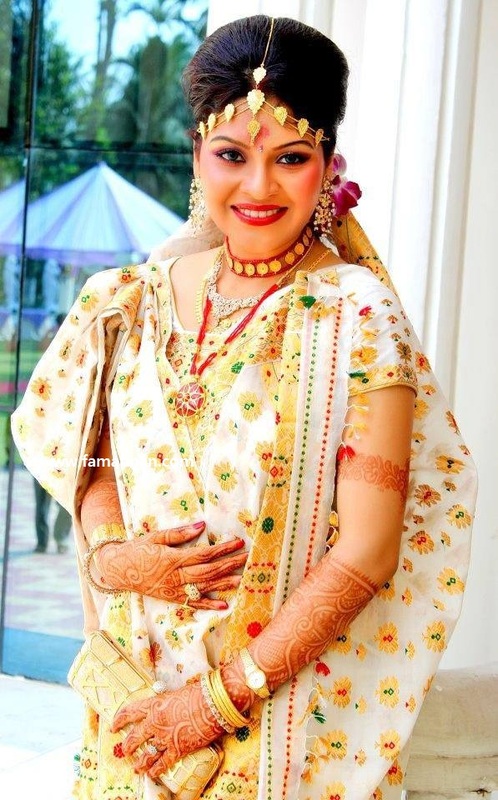 The bride is adorned with bangles, mang tikka and payal along with exquisite ear accessories; among other items of both traditional and contemporary jewelry. The bride also wears a “Mukut” which is a tiara made from “Shola” or foam. The bride’s forehead is adorned with “Alpona” which are designs made from sandalwood paste and her feet and hands are accentuated with “Alta” designs; which is a temporary and red skin-safe dye. The traditional bridal garment of the Malayalee bride is the “Mundu”; this is a two piece saree and the bride is mostly adorned in flowers and jewelry. The Mundu is a silk garment and in most cases the Mundu is cream colored with a shimmery gold embroidered border. In many instances the contemporary modern bride may choose to go with a resplendent red saree and Malayalee Christian brides may even opt for a Western style wedding gown. 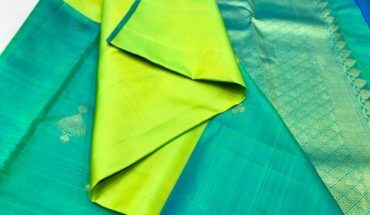 The average Tamilian bride is most likely to wear a 6 to 9 yards long Kanjeevaram Silk on her wedding day. Kanjeevaram sarees are sought after all over India but no one wears it better than the Tamilian bride. 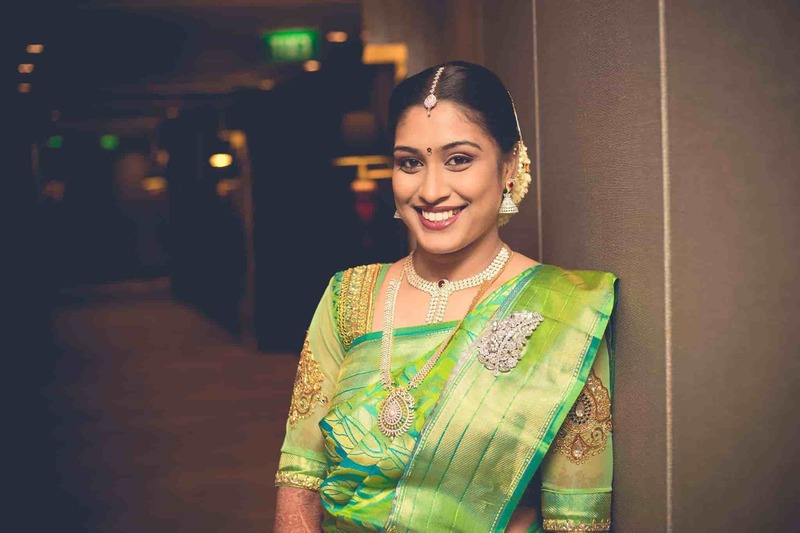 The Tamilian bridal look is often accentuated with flowers in the hair, hair braid accessories, nose rings, toe rings, earrings, the “Manga Malai” which is a mango shaped necklace and beautiful armlets among other jewelry pieces. The lehenga choli is often the outfit of choice for brides in North India. Much like the Punjabi bridal garments; these lehenga choli outfits are often embroidered and accentuated with crystals, stonework, Kundan and even mirror work. The jewelry is mainly gold ornaments like the mang tikka, Sitahar, Jhumar earrings, kangan, churi, kamarbandh, and bajubandh among others. Christian’s are a religious minority spread all over India. Christian weddings are very much like what one would see in Hollywood movie and the bride is almost always dressed in perfect white gown with a delicate lace veil and a long train. However, many Indian brides do opt for the white saree. Christian brides opting for a white saree are very common in Kerala which has a significant population of Christians. 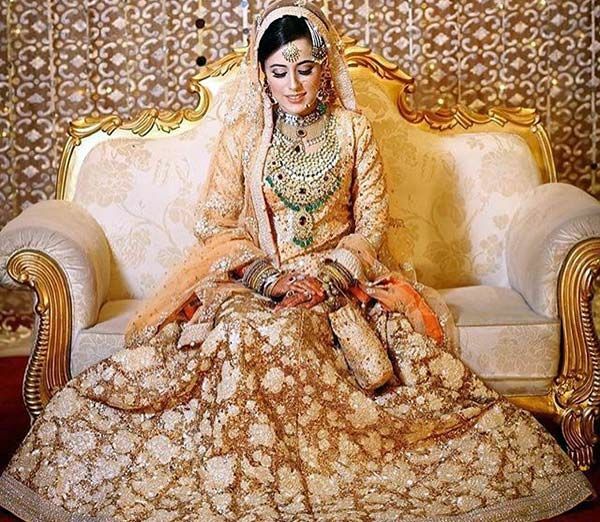 Similar to Christians; followers of the Islamic faith are spread all over the country and Muslim brides almost always opt for the Anarkali Salwar kameez on their wedding day. This is known as the “shadi ka joda” and is almost always shades of red, pink and maroon. Green is also a popular color among Muslim brides. The traditional Bhaku is the garment of choice for a Sikkimese bride on her wedding day. The Bhaku is a sarong-like wrap around brocade skirt that is worn with a full-sleeved blouse of fine Chinese silk. Jewelry is minimal and limited to pure gold ornaments in most cases. The Bakhu is not a garment for spinsters and is worn to signify marital status in the affirmative. 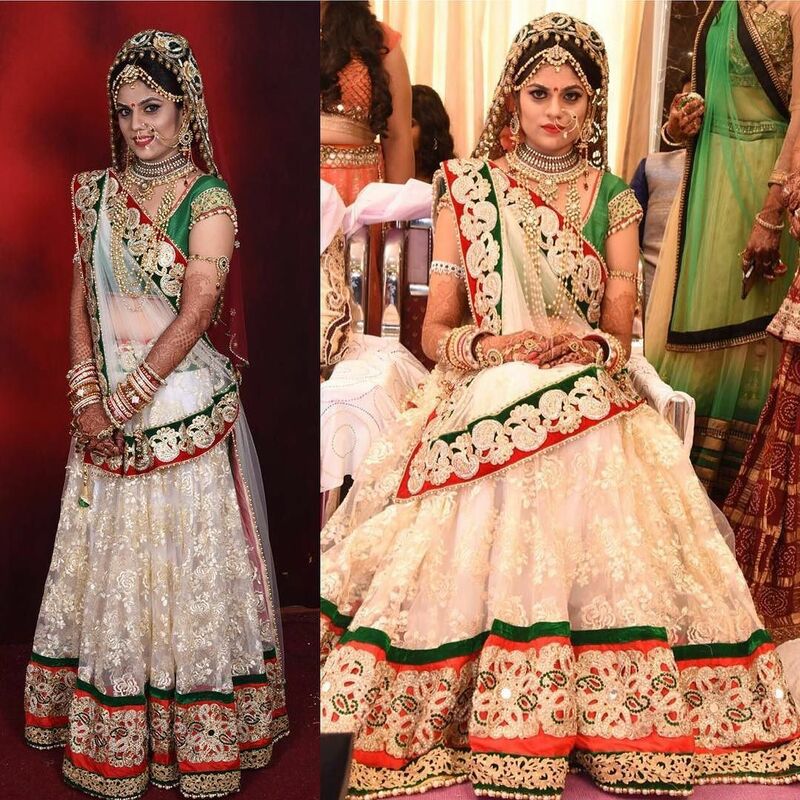 Similar to Punjab and North India; the Rajasthani bride almost always opts for the traditional lehenga choli ensemble on her wedding day. Rajasthani bridal wear is predominantly in silk fabrics and is heavily embroidered and embellished. 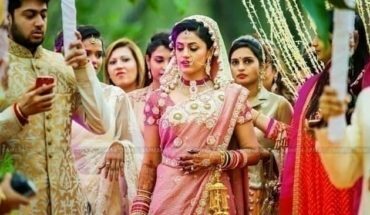 The bride is also adorned in exquisite jewelry pieces like the nath (nose ring), bajuband (armlet), and kamarbandh for the waist, chuda (ivory and gold bangles), Jhumar earrings and diamond studded choker necklaces known in Gujarati as Timaniyaan. The Gujarati bride wears two distinctive Gujarati sarees on her wedding day; the Panetar and Gharchola saree. The Panetar saree is gifted to the bride by her uncle and is worn for the entire duration of the wedding ceremony and the bride changes into the Gharchola saree gifted to her by her in-laws soon after the ceremony. The jewelry is predominantly gold and features pieces like the Nath, mang tika, bajubandh, kamarbandh, choker necklaces, and earrings. The “Pheran” which is a coat-like long sleeve garment is the traditional outfit of Kashmiri women. A Kashmiri bride will most often look her best in an embellished and embroidered version of the “Pheran” on her wedding day. In addition to the bridal Pheran; the Kashmiri bride will often wear a veil to cover her face for the duration of the wedding ceremony. Mekhla Chadar is the traditional dress for Assamese brides. This two-piece ensemble is similar in appearance to a saree. The lower garment (Mekhla) is a wrap-around skirt with pleats in the front while the Chadar is draped over the upper. This outfit comes in multiple colors however off-white seems to be the traditional choice. The Mekhla Chadar is a heavy bridal ensemble; accentuated with exquisite gold and silver thread zari work. The bride is generally adorned in gold ornaments on her wedding day and “Alta” application to hands and feet is as common as it is in Bengal. The Himachali bride is similarly dressed as Punjabi and North Indian brides are; in exquisite lehenga choli ensembles. The jewelry pieces are also quite similar however what set the Himachali wedding apart is its unique customs and traditions. Maharashtrian brides are as simple as their customs. Most of the brides prefer pink shades of saree for their wedding and complement with simple jewelry sets. The pearl beads hanging around the head is the highlight of this Maharashtrian brides. Look at this pretty Kannada bride in simple yellow saree. Her eyeshades are just stealing my eyes. The flower set on her hair gives the perfect look of the South Indian bride. Similar to Tamil Nadu bride, the Telugu brides opt for the traditional Kanchipuram silk sarees. Most of the Telugu weddings are rich in both customs and outfit. 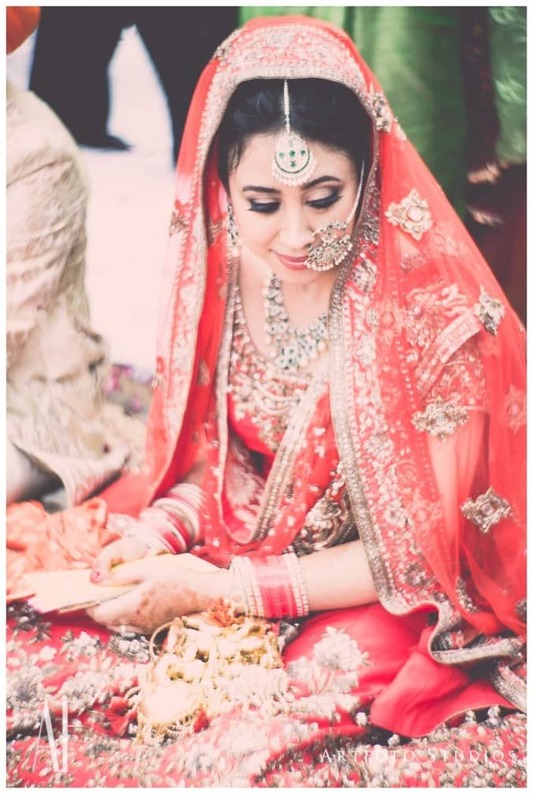 The bride is just looking stunning in the heavy embroidered bridal blouse and diamond jewellery sets! Most of the Nepali brides opt for a bright red attire for their wedding which is paired with gold jewelry sets with the hand full of bangles which touches the deep tradition of Indian culture. Manipuri bride’s look entirely different other parts of the country. The brides will be in their “Potloi” which looks like life-size dolls! From heavy headdress to matching gold jewellery sets the bride is looking very pretty. Bihari brides are simple and elegant on their own style. Generally, Bihari bride opts for red or yellow silk sarees. The simple veil in the head adds beauty to the entire bridal look. The culture of Goan Catholics is a mixture of Portuguese and Indian cultures. 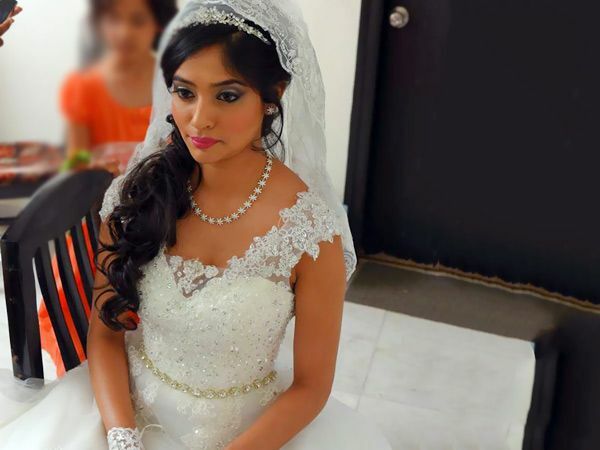 Goan brides retain their Hindu caste customs and systems in their marriage. In regards to all this, the Catholics bride wear a virgin white wedding gown for their wedding. Who says no to lehenga? Lehenga is a part of our tradition, which is customized based on our ideal taste. Kundan jewellery sets are the perfect choice for bridal lehenga. As shown in the above picture, the rich pink lehenga is complimented with heavy work green Kundan jewellery sets. In conclusion; almost regions within India have their own customs, culture, and tradition. Bridal attire anywhere in the country is subject to local customs and traditions and while bride from some communities within India may wear similar bridal wear; brides from other communities have a wedding traditional look that is completely unique.